Preheat oven to 375-degrees. Grease a non-stick doughnut pan with cooking spray. Measure the milk in a liquid measure, add remaining liquid flavorings. In the bowl of the food processor, combine all the dry ingredients except the dried cherries and blend until the nuts have been pulverized and the mixture looks uniform. Add the sour cherries and pulse only 2-3 times to break up the cherries into smaller pieces, but do not completely pulverize the cherries. Pour out the dry mix into a medium-sized mixing bowl and mix the wet into the dry by hand to keep from cutting the cherries up further. Immediately spoon the mixture into the prepared doughnut pan. Divide it among the six holes, placing it directly in the middle over the 'hole', use a finger to clear the batter off the 'hole' and smooth it a bit to fill them evenly. Bake 13-14 minutes and remove the pan from the oven, loosen the middles which may stick just a bit, with a fork before carefully turning the doughnuts out onto a cooling rack, and immediately place them bottom sides up back into the doughnut pan. The middles may have baked over the hole section of the pan a bit, but carefully just press them back down into the pan, remove any extra crumb/clumps. Flipping them during the baking process crisps up the bottoms and gives them an overall better doughnut form. Return them to the oven and bake another 4 minutes. Remove to a cooling rack. 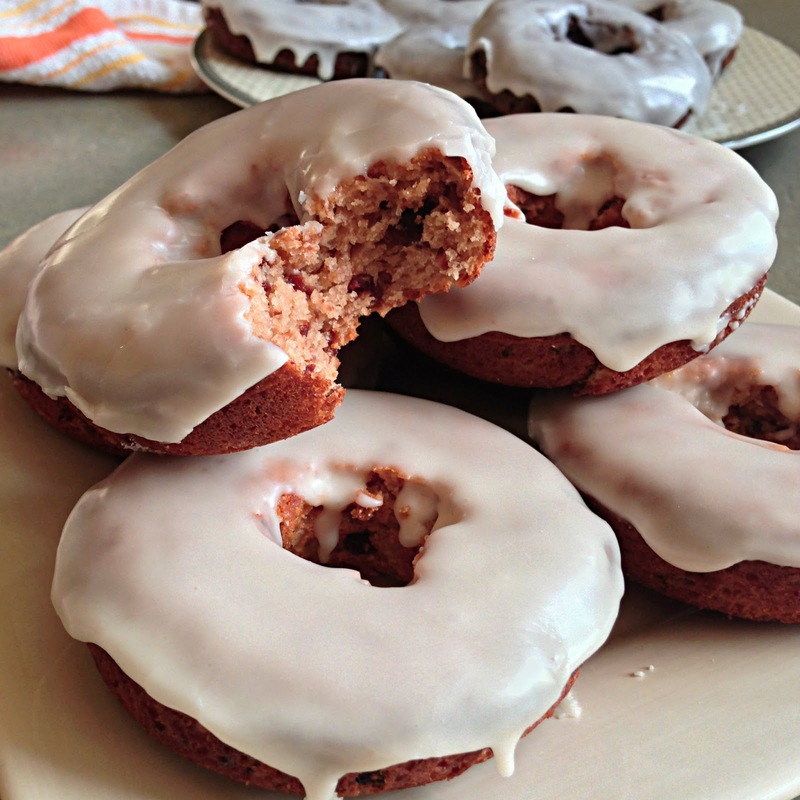 Once cool, glaze doughnuts (below). Stir until well combined and then dip in each doughnut. This mixture should be thin enough that it sticks to the doughnut but not so thin that it all drips off. This recipe makes 6 doughnuts.